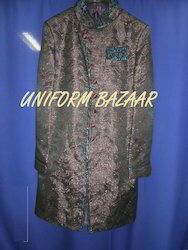 Pioneers in the industry, we offer mens indo western and groom kurta pajama- kpc-7 from India. We have come up with Mens Indo Western, which is designed as per the latest market trend. These Mens Indo Western are fabricated using high grade silk, which provides softness. Our Mens Indo Western are offered in various sizes, designs and color combinations, which meet the clients demands. Our Mens Indo Western are available in various sizes, designs and patterns. Groom Kurta Pajama- KPC-7 offered is made available in single color finish with highlighted collars, button line and arm cuffs with golden gota work. 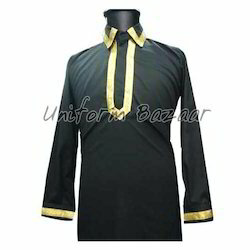 We can offer these kurta pajamas in choice of different sizes to pick from. Some of its features include provide for smart dressed appearance; innovative combination of cut designs which make these all the more wanting and demanded; available to customers at very reasonable rates; provides for a gleaming finish to the overall dressed presentation.